The Pioneers battled with the top team in the 5A standings, but wound up falling to the Foxes 64-47. 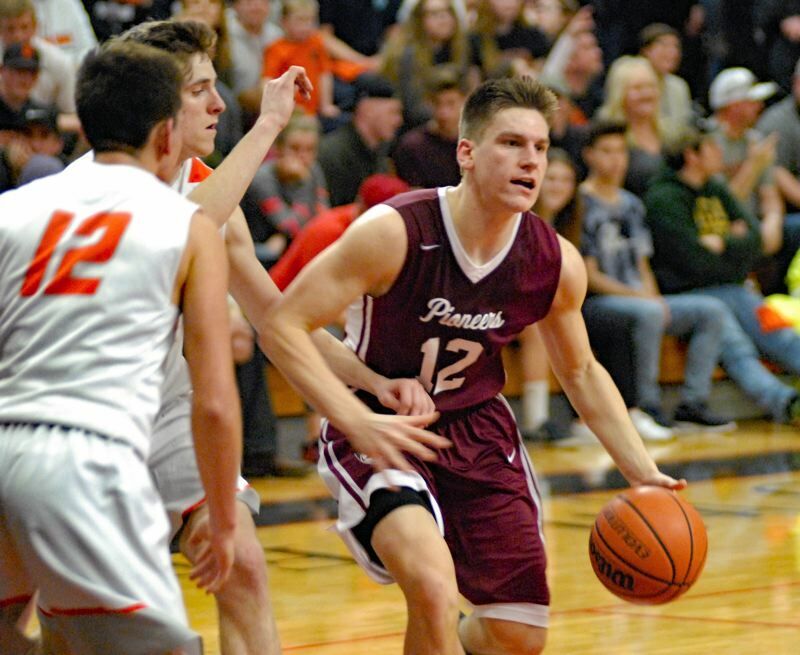 SILVERTON — While Sandy hung with the top-ranked team in the state for most of the night, Silverton's sharp shooting from behind the arc was too much for the Pioneers to handle. Silverton nailed 14 3-pointers on the night as Sandy fell to the Foxes 64-47 in their first round playoff game on Saturday. The Pioneers couldn't buy a bucket down the stretch, missing 11 out of their last 12 shots to end the game. "(Silverton) just hit some big shots and we didn't. That's basically all it was," Sandy guard Colton Gorski said. From the get-go, it felt like Sandy was always playing catch-up. Gorski committed a pair of ticky-tac fouls early in the opening quarter and was forced to sit on the bench for most of the first half. Silverton took advantage by going up 22-10 on the Pioneers after one period. "We missed some good looks early on and since we are so young, I felt like it took us a while to get relaxed and used to the atmosphere," Sandy head coach Jason Maki said. "We knew we needed to play one heck of a game and we played well for three-fourths of the game…Hats off to Silverton, we're just sad that it's over." Silverton looked like they were ready to put Sandy away in the second quarter, taking a 19-point lead at 32-13 midway through the period. But thanks to layups by Wyatt Fisher and Jaden Robinson, plus five quick points by Kaleb Hubbard, Sandy was able to go on a 9-0 run to get the lead down to 10. "That run showed what this team has been about all year," Fisher said. "We looked to be down and out, but we fought…We could have gotten down to single digits, but we were just missing shots that we normally hit." Look for extended coverage in the March 7 print edition.